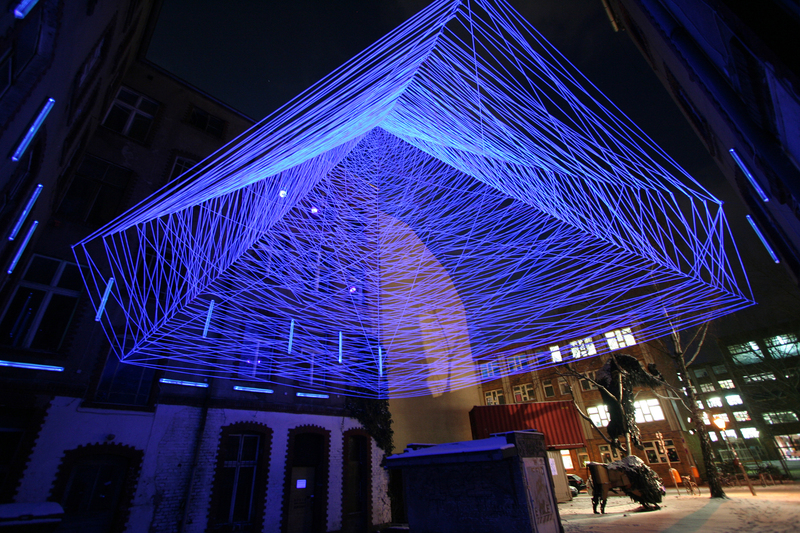 Jeongmoon Choi is a Korean-born, Germany-based artist living and working between Seoul and Berlin, known for creating arresting installations from colored wool and UV light. Jeongmoon Choi’s artistic diversity speaks for itself. Her remarkable installations have always been a subject of fascination, especially considering that her artwork has the ability to transform any environment, maximize any room, and wash away or carefully define all of the edges. Impeccably precise, Choi’s light installations create a new, science fiction-like environment that can trick your brain and transport you to a different dimension. "Drawing in space" constantly challenges the perception to imaginary supplement the concrete visible. Through the joint interplay of surfaces and lines on the one hand and the contrast-rich relationship of different perspectives on the other hand, a unique space and depth effect is created. As a counterpart to the color palette threads are used as a drawing material. And so threads are drawn to both classical surfaces such as canvas and also freely in space. The interesting thing about the use of threads as a material is that they are both very easy to destroy, but on the other hand, form very strong and powerful structured patterns. The works thus produce a tension that results from the pairs of opposites strength and vulnerability, security and risk. Faced with a room drawing emphasized by UV light (Black light) in a darkened room viewers are initially disoriented. But then they quickly find access to one of the many possible perspectives and enjoy it finally to be able to engage in ever new ways of perceiving. By many visitors, such an experience is described as a meditative state. 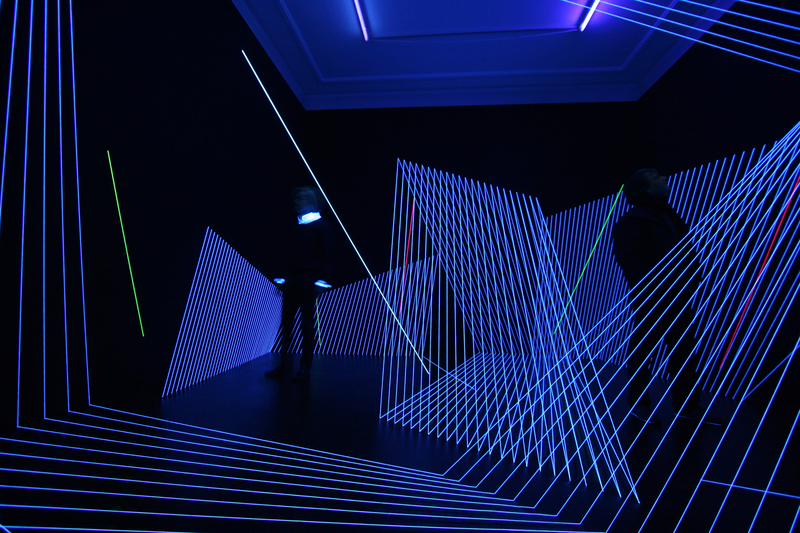 The UV light (Black light) causes the room/location/space as the installation's surrounding, three-dimensional work surface - to dissolve its original features to create a new space, which is inextricably linked with the installation. It keeps the room in a continuous change of reference between the inside and outside, thus showing the paradoxical dual nature of space perception. The three-dimensional drawings give the impression that it is about to empty and then back to the stuffing of the space, reversing and turning. "Drawing in space" plays along the main themes in my current work process, which are "housing", "nature/natural disaster" and the human race in between. Here I deal extensively with the subject dwelling and nature.